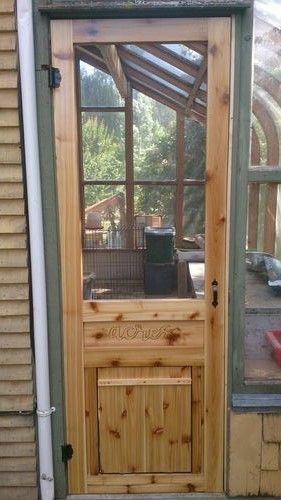 So, I built some screen doors for a client in the summer, and said I would work on a solid wood cover for the one door for winter time. I basically have a hole that is 20.5×40.5 x .5 inches to cover with a removable panel. 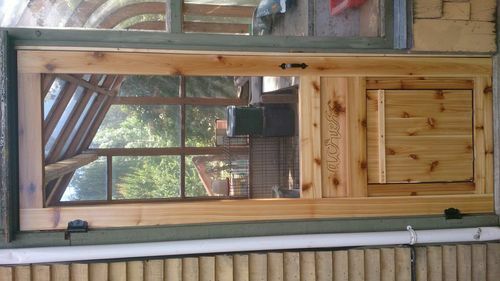 I was going to build a 3/8 thick panel just under the dimensions, add some 1/2 inch trim that overhangs all the edges, and that would attach somehow to the door. However, how do I minimize visible attachment points in the frame during the summer? I’m not stuck on this idea if you have a better one. Sorry the pic is rotated, I wasn’t sure how to fix it on here! Maybe threaded inserts in the door, and machine screws to attach? How about making the insert as you describe and them making a rectangular frame for the other face of the door. The fasteners would be in the insert and frame, effectively sandwiching the door opening by squeezing tight. No impact on the door itself. This is how the glass panels in many metal doors are held in place. Screws run between the trim frames on both sides not into the metal door itself. Jerry, that’s what I was thinking about too, and maybe have a second set of shorter machine screw with wooden plugs on top to cover the holes when it’s off. Also, how did you magic that into the upright position? Kazoo, the screen is stapled in place inside a rabbet on the inner side, which is then filled with a framing piece that is proud of the surface. I would have to go through the frame or the screen to get to the other side. I also thought about the attachment points coming through the sides of the door frames and into the sides of the panel, but that might be a little tricky to do in place. I don’t have anything to contribute other than I think that is a really good looking screen door. My compliments. I have actually done this before with a set of “storm windows” on a screened-in porch. I just left the inserts (sized for #8×32 screws) exposed in summer. They were pretty discreet. You might put a “decorative” screw in there, but I wouldn’t do anything that calls attention to the insert. how did you magic that into the upright position? Art, thanks! First time doing mortise and tenon…some of them needed a little more epoxy than others! Jerry, the threaded inserts at Home Depot are just too big to be discreet, so I looked at some brass machine screws. I had decided to countersink a hole in the other side of the frame to run a 2” machine screw into a wingnut on the front side. But now I think I’m just going to predrill some holes for small brass screws, and when the cover is not in use, they can just have the brass screws in there to fill the holes, and they won’t lose track of the screws. Even though both the wood and the screws are soft, they’ll only get used twice a year, so hopefully it doesn’t wear too fast. Even if it does, they can always go to a larger screw. Thoughts? Am I just taking a shortcut, or do you think it would work?